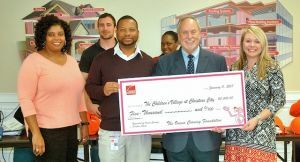 On behalf of the Owens Corning Foundation, representatives of Owens Corning–Fairburn presented a check for $5,000 to support the ongoing needs of victims of child abuse and abandonment who now live safely at The Children’s Village at Christian City in Union City. On the front row, from left: Lisa Anderson, human resources leader; Eric Crump, plant leader; Philip Kouns, chief operating officer of The Children’s Village; and Ashley Bonner, Christian City director of development. On the back row: Christopher Zins, furnace engineer; and Jalisa Arnold, crew person.